My name is Virginia Smith. 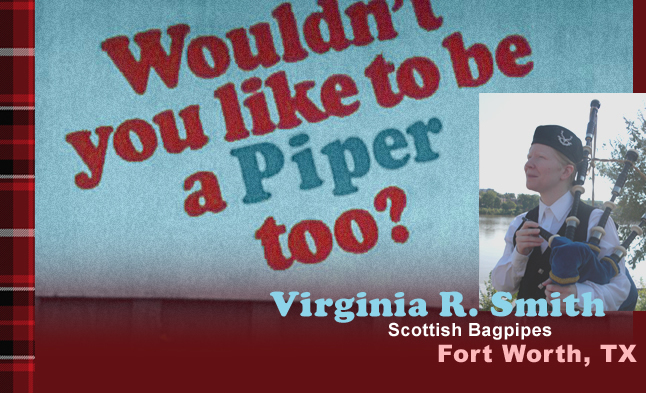 I am a full-service bagpiper in Fort Worth, Texas. 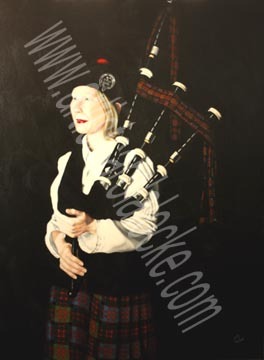 I teach people of all ages to play the Great Highland Bagpipe and have performed at a variety of events. I would be happy make your event special. If you are interested in bagpipe performance or bagpipe lessons, take a look around and contact me if you have any questions or if you would like to be a piper too. by Carola Locke, a talented local Fort Worth area artist. Carola creates beautiful, larger-than-life acrylic portraits, hand painted with old-style quality and amazing photo realism. Commision your unique family heirloom! Check out the News link and scroll down to see a larger version. 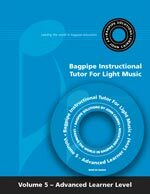 Audio examples for bagpipe students to listen to while learning music, recorded at reduced tempos with a metronome. Whether you take lessons with me or not, feel free to give these a listen, and click here to learn about lessons. See what my studetns and I have been up to in these brief reports of recent exploits.